Bounce your way to lower error rates with Donor-ID™. 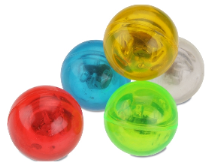 Stop by booth #500 to learn about Donor-ID™ and the many benefits of implementing the collection site software at your blood center and receive this fun, bouncing, blinking ball! There will be V.I.P. demonstrations of Donor-ID™ given by invitation only from 9:30 am – 11:00 am on Sunday, or 8:30 am – 10:00 am on Monday and Tuesday. Please contact Bryan Sadorf to arrange your VIP session.